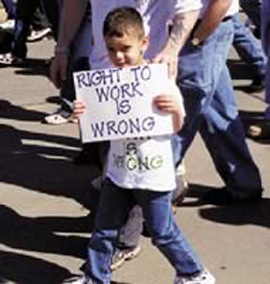 A young boy at a labor protest holds a sign showing his feeling on right to work laws. Photo Courtesy of Bob Wood/International Association of Machinists. States with right-to-work laws have the lowest rate of union membership. Right-to-work laws mean that workers are not required to join a union after they are hired by a company. They have the choice to join or not. Companies that hire workers under right-to-work laws are called open shops. Workers save money by not joining a union because they do not have to pay union dues. On the other hand, wages are usually lower in open shops than they are in union shops. Labor unions in open shops are much weaker than labor unions in states with union shops. The lure of lower wages has prompted many companies to relocate from states that have union shops to states that have right-to-work laws. Click on Maps below for additional information on Right-to-Work Laws.